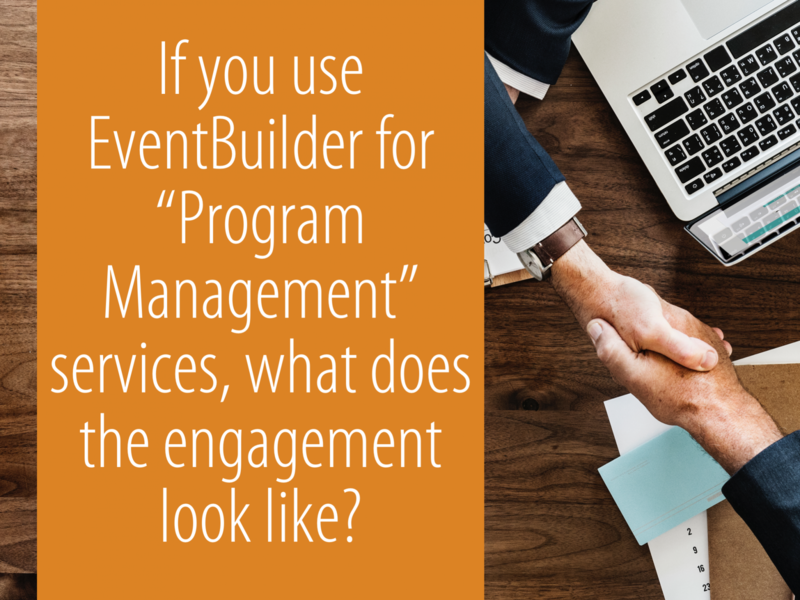 If you use EventBuilder for "Program Management" services, what does the engagement look like? Most people understand what 'producing a webinar' looks like. Often, however, 'Program Management" is less understood because it's simply viewed as "just a lot of individual webinars on one contract." But we at EventBuilder look at it differently. We hope that you will, too. Program Management is an extension of your business. We become an outsourced talent pool for one aspect of your organization -- virtual events. That, by definition, is always a highly customized thing which goes beyond asking you what your goal for the event is. Instead, we act like partners and ask you your organizational goals, and then take seriously the idea that it's our role to help you get there. 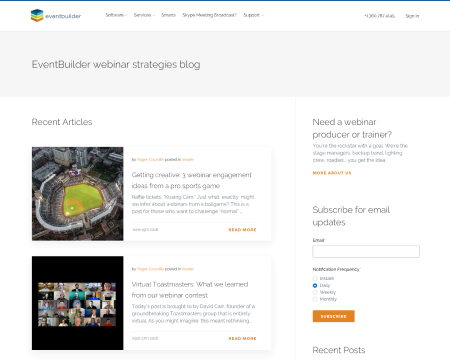 EventBuilder is in the services business, but labor isn't instantly scalable like technology. You benefit because we're good stewards with a finite resource...our crack team (and we choose not to operate like a mass-staffed call center that, by definition, can't be staffed with the same level of talent). Priority scheduling means that whenever we can make it happen, you "get dibs" on those occasions when we're at capacity and have to turn someone down (or, rather, suggest a different time when we do have capacity). Plenty of organizations offer some for of prioritized support, but here at EventBuilder there are four of us managing partners (out of twenty) who are owners. In other words, we've got direct, working relationship with clients, too. It's a nice buck-stops-here perk for our Program Management clients. Unless your webinars and webcasts happen in a vacuum, they inevitably connect somehow to other parts of your business in with regard to people and process, data and technology, or both. And unless you're sitting still and going nowhere, stuff comes up, stuff changes, and time is expended adjusting. It's just how life and business work, and if you've ever had part of a day disappear because something came up and you needed to adjust, you know exactly what we're talking about when we say that we'll handle it, proactively and as far as we can take it, as your Program Management partner. Review all Managed Event request submissions to encourage high-quality descriptions that conform to team standards as well as track down any missing information from stakeholders. Work with stakeholders to create a unified branded experience for web conferences. Review and implement images, demographics, surveys and polling features on the Gateway. Onboard new users/sponsors to the platform, including platform training as needed and a full review of options, features and standards. Weekly cumulative all up registration and attendance reporting, formatted to your team’s design. This will allow quick access to data gathered from web conferences. Capturing all event and registration needs and details from event stakeholders. Scheduling the event and building the registration page on your Gateway with the EventBuilder platform and providing a registration URL to stakeholders. Conducting a one-hour rehearsal/presenter training session, which includes a technical check for presenters, webcast best practices consulting, and training on the EventBuilder platform and Skype for Business, as needed. Conducting a pre-conference 30 minutes prior to event start to cover final details, agenda, instruction, and provide assistance to the presenters. Moderating the live event, which includes: kicking off the event by providing audience instruction and introducing the presenters, providing technical support for presenters and attendees, guiding the Q&A and polling process, acting as communications hub for organizers, presenters and attendees throughout the event, posting the attendee feedback survey and closing the event at the end. Finalizing the event archive page to make it suitable for attendee viewing on-demand, or restricting access as needed within 48 hours of event delivery. Providing a final attendance/registration report, Q&A logs, and attendee feedback results within 48 hours of event delivery. Managed events in excess of 5 per month will be invoiced at the discounted price below at the end of each quarter as follows. Most services businesses *say* that they customize and tailor what they do for you, but there's a lot of variance in what is meant by that. We do one thing (webinar software and services) and we do that one thing very well so that you can be even better at what you do. We also aren't going to take your business if it's not a killer fit (who says that, publicly?) -- our relationship with you is that important.